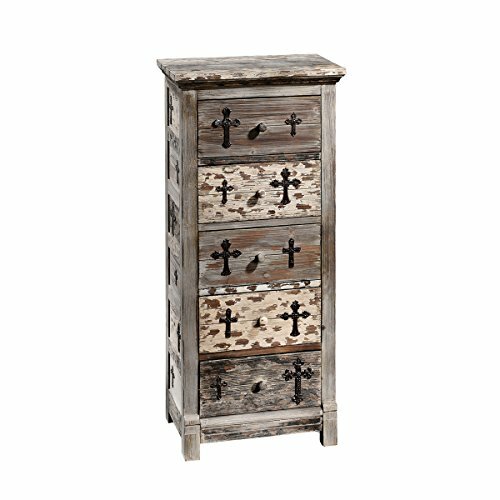 This Gothic Sanctuary Gothic chest of drawers will add a vintage Transylvanian vibe to any old bedroom! It’s perfect if your looking for an antique drawer chest or small dresser. Plus, it will go perfect with the Gothic End Table we featured some time ago. It’s a Gothic chest of drawers and table set! I love that the finish is all weathered and groovy! It reminds me of a dirty Western, like something out of Hell On Wheels or Deadwood but with a little bit of Castlevania all rolled-in-one! I imagine some times how things must have been in those days and this Gothic chest of drawers actually looks like some of the props they use on those shows! It’s another step closer to your perfect vision of a Gothic abode. Pick this baby up and you’ll finally have a few places to tuck away your gruesome little trinkets. But back on point, just looking at this cool Gothic chest of drawers makes me want to place it by some cool medieval torture devices! I’ll keep all my smaller, creepier stuff in there, like an apothecary chest from hell. So check this out if you’re in the market for a new bedroom dresser or Gothic chest of drawers and live Gothic today!